Fabrication attributed to Imam Ibn Qutaybah! It is often seen that many shia’s quote Al Imamah Wal Siyasah, a book attributed to Ibn Qutaybah- a sunni historianknown for his exactitude, to prove their beliefs. But it is known to little that this book is a fabrication. It is falsely attributed to Ibn Qutaybah. In this article, we will bring forth all the proofs, which will be enough to prove it a fabrication. The need for writing this article arose when they started to quote from this book that the second righteous caliph of Islam, Hazrat Umar (ra) attacked Bibi Fatima (as)!! So, did Umar actually do that? Kya Hazrat Umar (ra) ne Bibi Fatima (as) ka ghar Jalaya? قال وإن أبا بكر رضي الله عنه تفقد قوما تخلفوا عن بيعته عند علي كرم الله وجهه فبعث إليهم عمر فجاء فناداهم وهم في دار علي فأبوا أن يخرجوا فدعا بالحطب وقال والذي نفس عمر بيده لتخرجن أو لأحرقنها على من فيها فقيل له يا أبا حفص إن فيها فاطمة فقال وإن فخرجوا فبايعوا إلا عليا فإنه زعم أنه قال حلفت أن لا أخرج ولا أضع ثوبي على عاتقي حتى أجمع القرآن فوقفت فاطمة رضي الله عنها على بابها فقالت لا عهد لي بقوم حضروا أسوأ محضر منكم تركتم رسول الله صلى الله عليه وسلم جنازة بين أيدينا وقطعتم أمركم بينكم لم تستأمرونا ولم تزدوا لنا حقا. ~ See: al-Dinawari, Abu Muhammad ʿAbd Allah b. Muslim b. Qutaybah (d. 276/889). al-Imamah wa al-Siyasah, ed. 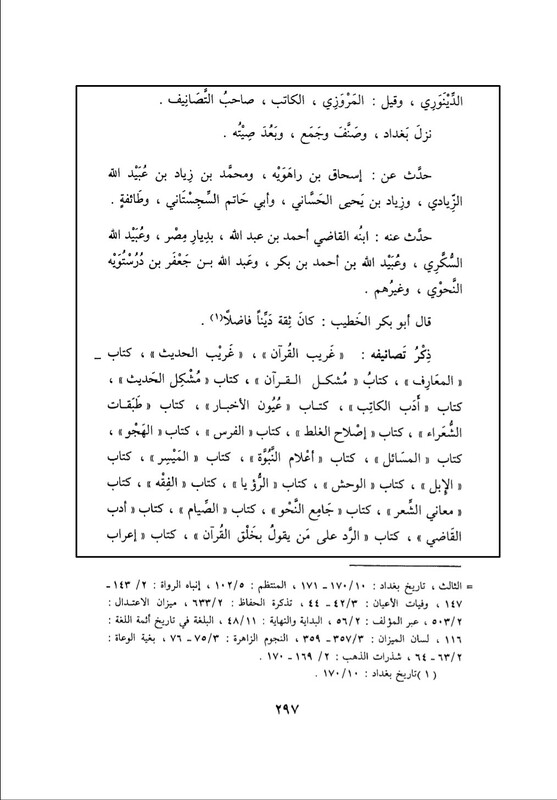 Khalil al-Mansur (Beirut: Dar al-Kutub al-ʿIlmiyah, 1418/1997), I: 16; Shiri edition, I: 30; Zayni edition, I: 19. The Great Book of the Meaning of Poetry [Kitab Ma’ani Al Shi’r Al Kabir] comprising 12 books (chapters), The Horse (46 sections), The Camel (16 sections), The Scab (10 sections), The Mange (20 sections), Regions (Dwellings) (10 sections), Winds (31 section), Lions and Wild Beasts (17 section), Reptiles (14 sections), Oaths (faith) and Calamities (7 sections), Women and Amatory poetry (1 section), Youth and Old age (8 sections), Mistakes (Tashif) Of the Scholars (1 section). The Sources of Information (Uyun Al Akhbar) comprising 10 books (chapters): The Sultan, War, Dominion, Dispositions, Learning, Asceticism, Brothers, Needs, Nourishment, Women. Legal Instruction (Al-Tafqih), three sections of which book I have seen, filling nearly 600 sheets in Bark handwriting. As it lacked some two sections, I enquired about the book from a group of the people of Al Jabal, who thought that it was extant [in complete form] longer than the books of Al- Bandaniji and better than his works. 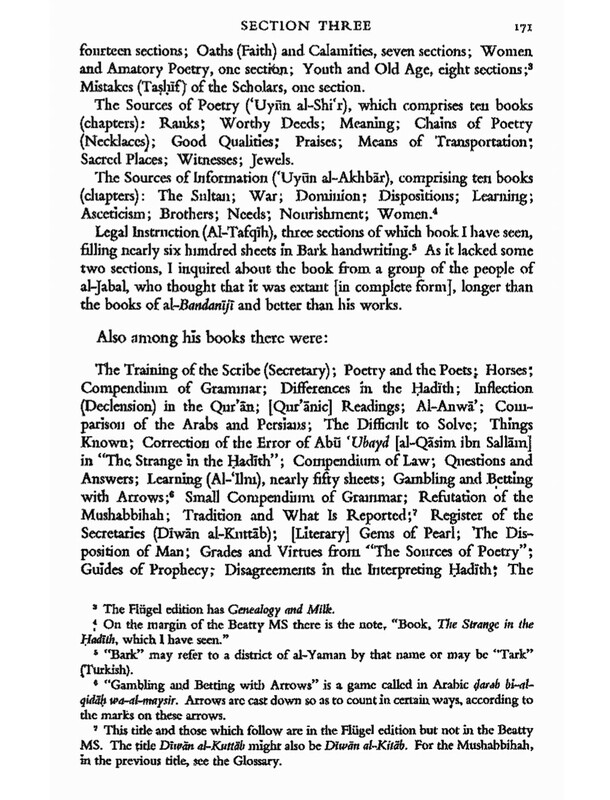 The Training of the Scribe (Secretary), Poetry and the Poets, Horses, Compendium of Grammar, Differences in the Hadith, Inflection (Declension) in the Quran, [Quranic] Readings, Al- Anwa, Comparison of the Arabs and Persians, The Difficulty to Solve, Things Unknown, Correction of the Error of Abu Ubayd [Al Qasim bin Sallam] in the Strange in the Hadith, Compendium of Law, Questions and Answers, Learning (Al Ilm) nearly 50 sheets, Gambling and Betting with Arrows, Small Compendium of Grammer, Refutation of the Mushabbihah, Tradition and What is Reported, Register of the Secretaries (Diwan Al Kuttub), [literary] Gems of Pearl, The Disposition of Man, Grades and Virtues from “The Sources of Poetry”, Guides of Prophecy, Disagreements in the interpretting hadith, The Wisdom of Proverbs, Drinks, The Manners of Society, The Strange in the Hadith. Fihrist Ibn Nadim, Eng Trans, Pg 170. Fihrist Ibn Nadim, Eng Trans, Pg 171. ~ Ibn Nadim (d.384H), Al Fihrist, Pg 105-106, Dar Al Maarif Publications, Beirut, Lebanon. (1) Kitab Ghareeb Al Quran, Pg 58, Book No 105. (2) Kitab Mushkil Al Qur’an, Pg 60, Book No 109. 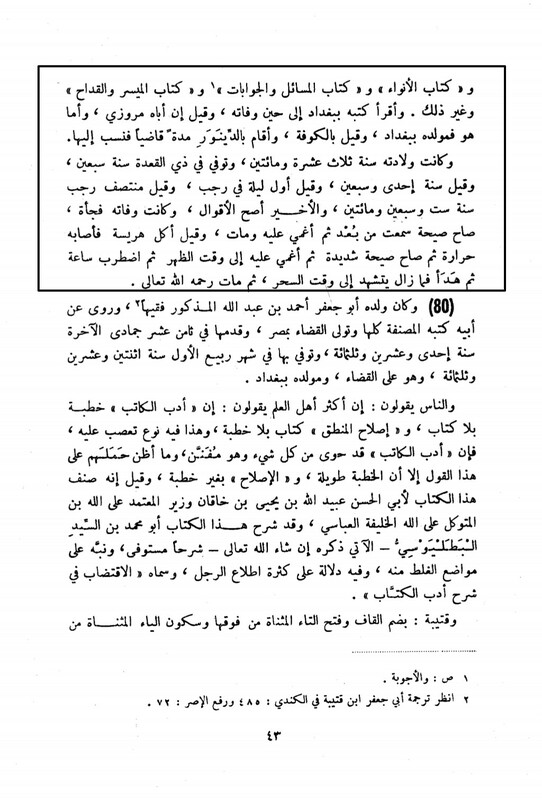 (3) Kitab Alam Al Nabuwa, Pg 128, Book No 210. (4) Kitab Sharah Ghareeb Al Hadith, Pg 158, Book No 290. (5) Kitab Islah Al Ghalat Al Waqiyi fi Ghareeb Al Hadith, Pg 159, Book No 291. (6) Kitab Taqreeb Al Ghareebayn Li-Abi Ubayd, Pg 164, Book No 296. 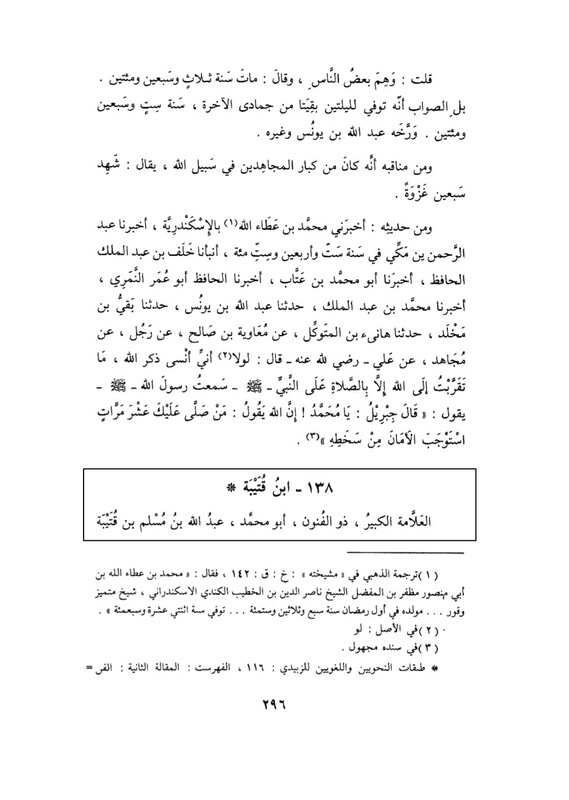 (7) Kitab Al Masa’il, Pg 164, Book No 297. (8) Kitab Mukhtalif Al Hadith Al Mud’ia Alayh Al Tanaquz talif, Pg 168, Book 310. (9) Kitab Al Ashrab, Pg 228, Book No 525. 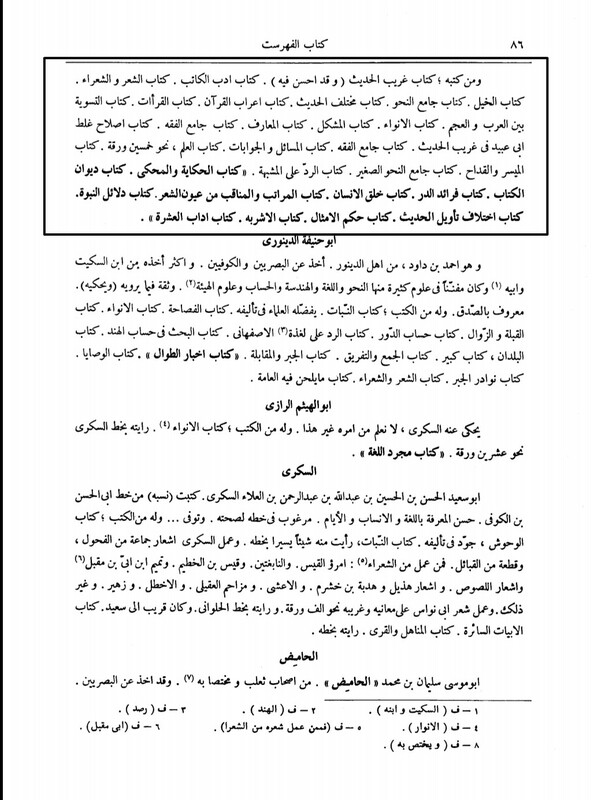 (10) Kitab Ibarat Al Royah, Pg 233, Book No 543. (11) Kitab Adab Al Khateeb, Pg 299, Book No 831. (12) Kitab Al Nahw, Pg 336, Book No 976. (13) Kitab Al Maarif, Pg 336, Book No 977. (14) Kitab Tabaqat Al Shuara, Pg 337, Book No 978. 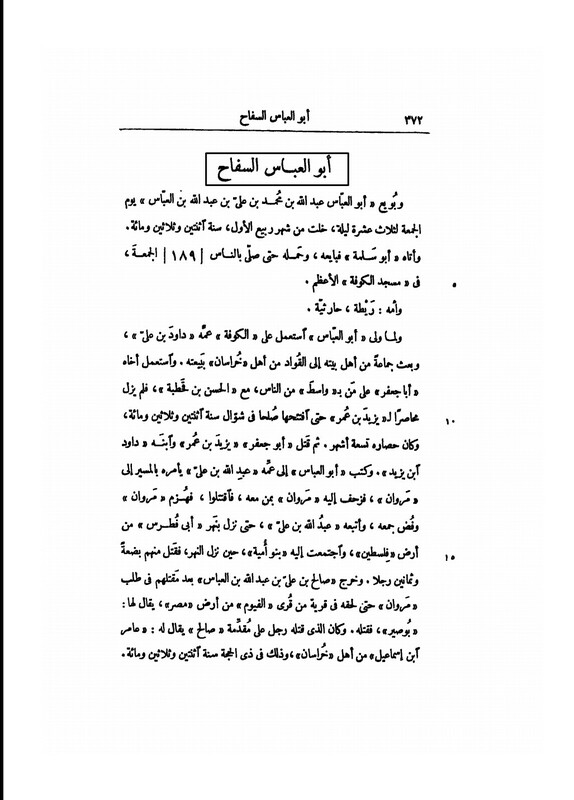 (15) Kitab Al Masa’il, Pg 337, Book No 979. (16) Kitab Al Qatah, Pg 337, Book No 980. 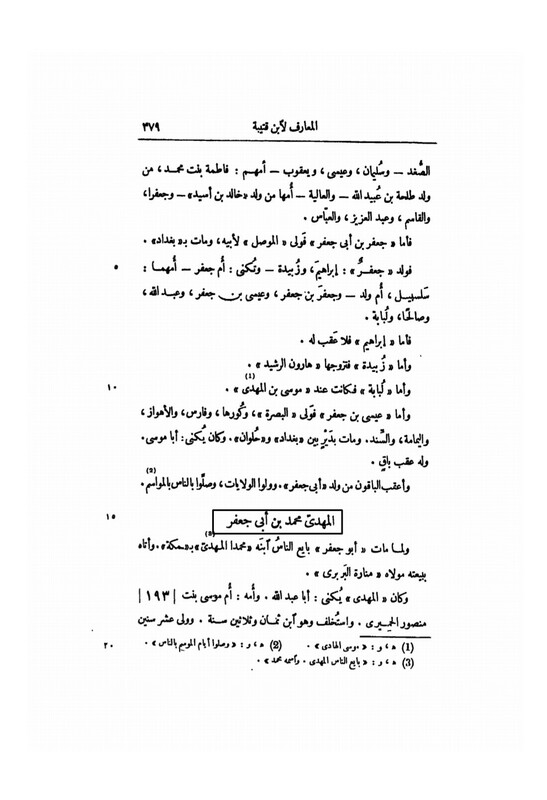 (17) Kitab Uyun Al Akhbar, Pg 337, Book No 981. 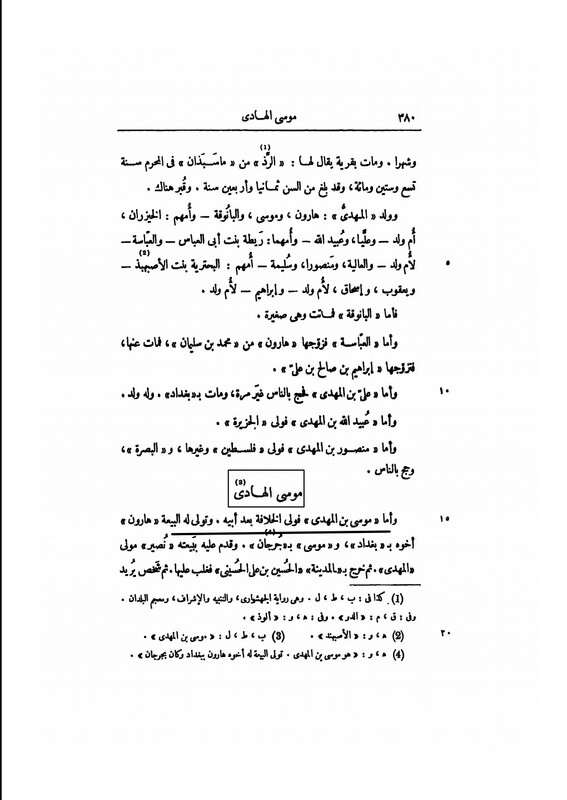 (18) Kitab Ma’ani Al Shi’r, Pg 337, Book No 982. 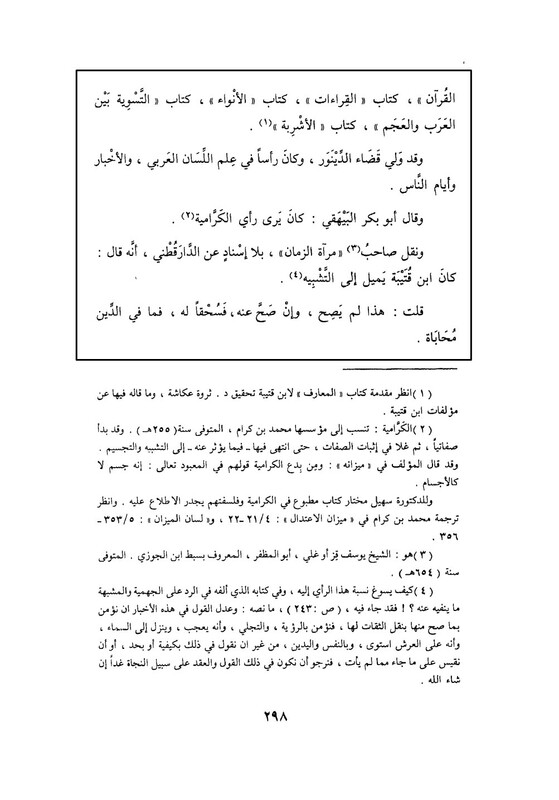 (19) Kitab Al Maisir, Pg 337, Book No 983. Abu Mohammed Abdullah Bin Muslim Ibn Qutaybah Ad-Dinawari (native of Dinawar), some say Al Marwazi (native of Marw)- the author of Kitab Al Maarif and the Adab Al Katib, was a grammarian and philologer of eminent talent and noted for the correctness of his information. 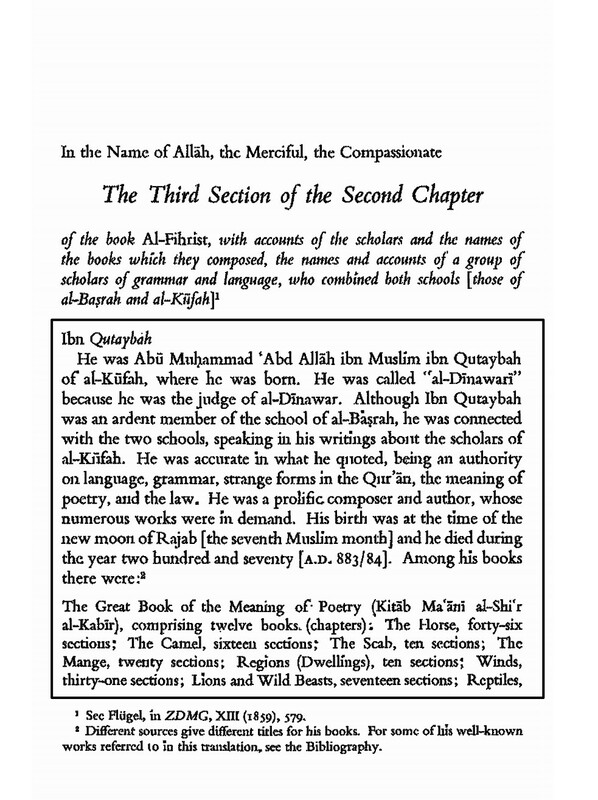 Besides the works just mentioned he composed a number of others equally instructive such as his explanation of the rare expressions occurring in the Quran, Explanation of the rare expressions occurring in the Traditions, the (1) Uyun Al Akhbar, (2) The Mushkil Al Quran (Obscurities of the Qur’an), (3) The Mushkil Al Hadith (Obscurities of the Traditions), (4) The Tabakat As-Shuara (notices on the poets), (5) The Kitab Al Ashriba (treatise on the different sorts of drinks), (6) The Islah Al Ghalat (faults corrected), (7) The Kitab At-Takfih (the instructor), (8) The Kitab Al Khail (treatise on horses), (9) The Seven Readings of the Qur’an analyser Grammatically, a work on the Anwa, (10) The Kitab Al Masail, etc (Book of Questions and Answers), (11) The Kitab Al Maisir wa’l-Kidah (on games of chance). ~ Ibn Khallikan (d.681H) Wafayat Al Ayan, Vol 3, Pg 42-43, Dar Al Sadr Publications, Beirut, Lebanon. وقيل: المروزي، الكاتب، صاحب التصانيف. Allamah Al Kabir, Al Khateeb, Sahib Al Tasanif, Resident of Baghdad. His books: (1) Ghareeb Al Quran, (2) Ghareeb Al Hadith, (3) Kitab Al Maarif, (4) Kitab Mushkil Al Qur’an, (5) Kitab Mushkil Al Hadith, (6) Kitab Adab Al Kateeb, (7) Kitab Uyun Al Akhbar, (8) Kitab Tabaqat Al Shuara, (9) Kitab Islah Al Ghalat, (10) Kitab Al Firs, (11) Kitab Al Huju, (12) Kitab Al Masa’il, (13) Kitab Alam Al Nabuwa, (14) Kitab Al Maisir, (15) Kitab Al Ibl, (16) Kitab Al Wahsh, (17) Kitab Al Roya, (18) Kitab Al Fiqh, (19) Kitab Ma’ani Al Sher, (20) Kitab Jaa’ma Al Nahw, (21) Kitab Al Siyam, (22) Kitab Adab Al Qadi, (23) Kitab Al Radd Ala min Ya Qawl Ba-Khalq Al Qur’an, (24) Kitab Al Airab Al Qur’an, (25) Kitab Al Qirat, (26) Kitab Al Anwa, (27) Kitab Al Taswiyat Bayn Al Arab wal Ajam, (28) Kitab Al Ashrab. ~ Al Dhahabi (d.748H), Siyar Al Alam Al Nubala, Vol 13, Pg 296-299, Al Muassasah Al Risalah publications, Beirut, Lebanon. ★ Four famous biographers, who wrote a detailed biography of Ibn Qutaybah mentioned many books authored by him (Al Dhahabi mentioning 28) but no one has mentioned Al Imamah Wal Siyasah as a book authored by Ibn Qutaybah. This, unanimously and undoubtedly, proves that the book is a fabrication falsely attributed to him. Besides, there is no chain of Narration mentioned for this story! We will now discuss about the mistakes in the book which clearly points out that it was not authored by Ibn Qutaybah! Saeed bin Kathir bin Ufair, Abu Uthman, Al Misri. 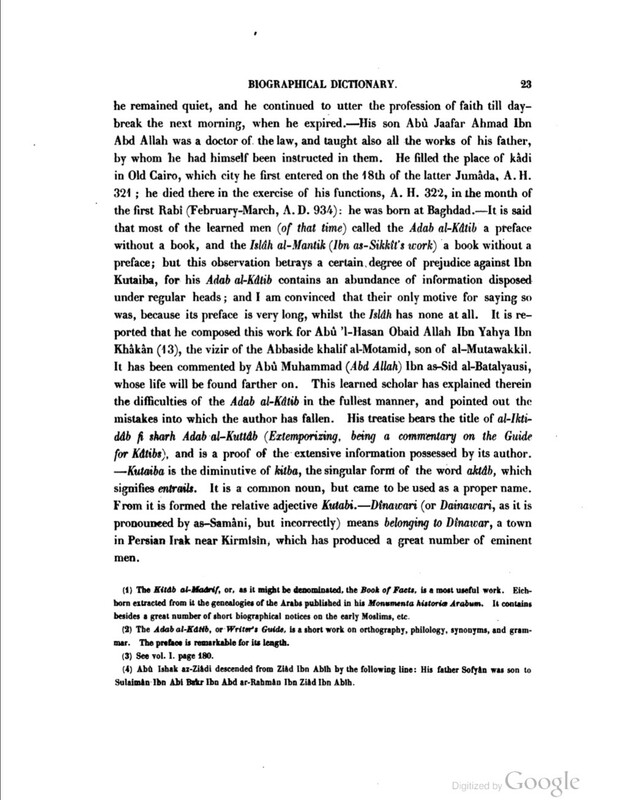 Imam Bukhari (d.256H), Tarikh Al Kabir, Vol 3, Pg 509, Narrator no 1693, Dar Al Maarif Al Uthmaniyya Publications, Hyderabad, India. Same can be read in Abi Hatim’s Al Jarah o Tadeel, Vol 4, Pg 56, Narrator no 248, Dar Al Ihya Al Tarsh Al Arabiyya Publications, Beirut, Lebanon. 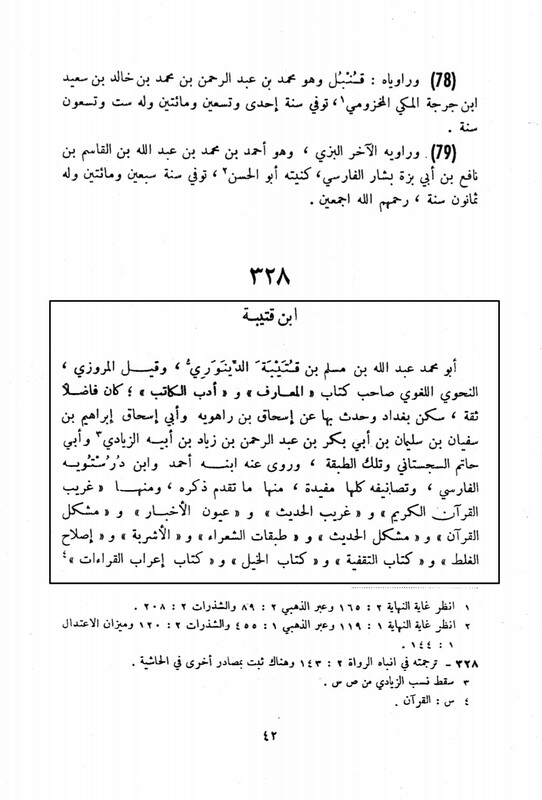 Imam Yunus Al Misri (d.347H) added the words ” مولاهم المصرى” meaning- “A master from Misr”. 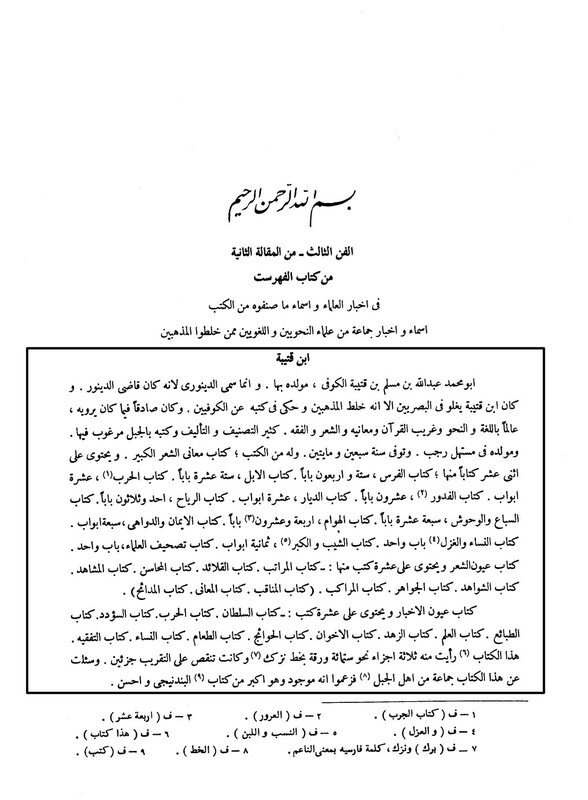 [See Tarikh Yunus Al Misri, Vol 1, Pg 210, Narrator no 564, Dar Al Kutub Al Ilmiyyah Publications, Beirut, Lebanon. 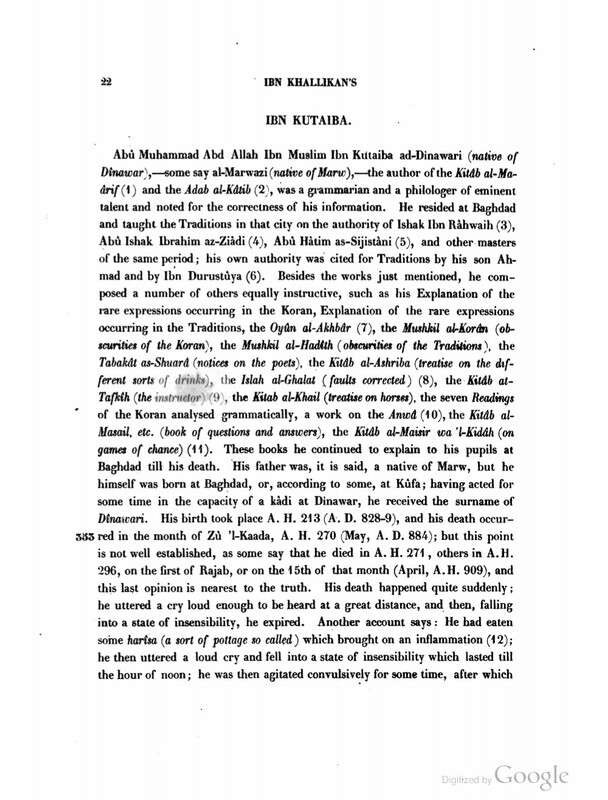 Imam Ibn Hibban (d.364H) adds ” أهل مصر” meaning- “He was a resident of Misr”. [See Thiqat Ibn Hibban, Vol 8, Pg 266, Narrator no 13364, Dar Al Maarif Al Uthmaniyya Publications, Hyderabad, India. Hence it is proven that Saeed bin Kathir was a resident of Misr and lived there throughout his life. But it is also noteworthy that Ibn Qutaybah never visited Misr in his whole life. There is also, no mention of him narrating from Saeed in his other books. Remember, Ibn Qutaybah is known for his accuracy. Then how can he make such a blunder! How can he lie? This certainly, without any doubt proves that this book is a fabrication. Our answer to them: Ibn Qutaybah wrote a complete chapter on, “أبو العباس السفاح” (Abul Abbas As Saffah) in his other book! [See Al Maarif, which is actually authored by Ibn Qutaybah (d.276H) and mentioned by all the biographers, vol 1, Pg 372, Al Hayyat Al Misriyat Publications, Cairo, Egypt]. Ibn Qutaybah knew that Abu Abbas and As Saffah was the name of the same person! The readers would be shocked again to know that Al Mahdi was succeeded by his own son Musa Al Hadi and not by Harun Al Rashid!! Ibn Qutaybah writes in his book, Al Maarif, Vol 1, Pg 380-381, Al Hayyat Al Misriyat Publications, Cairo, Egypt]. 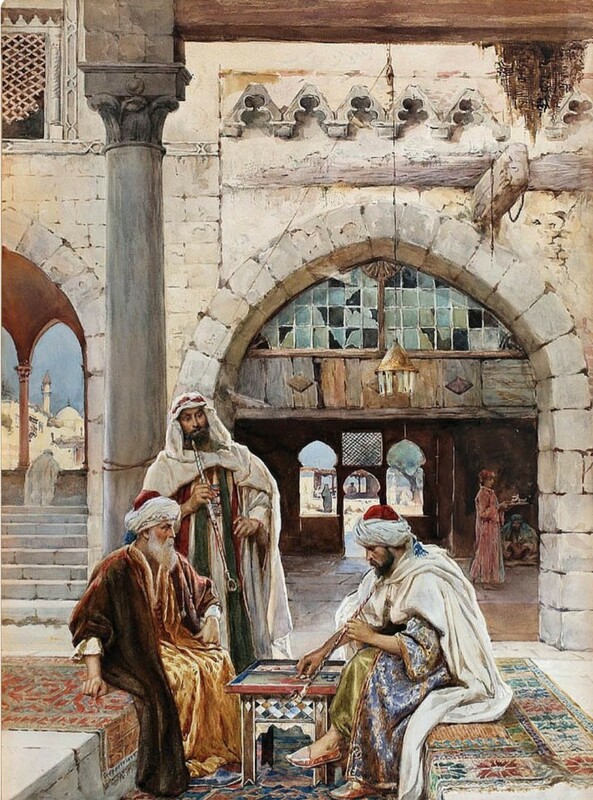 Musa Al Hadi, also known as Musa bin Mahdi became the caliph by taking the bayah. He writes on the next page that Harun Al Rashid became the next caliph, after his father Musa Al Hadi. I will not comment on this blunder. You can understand. 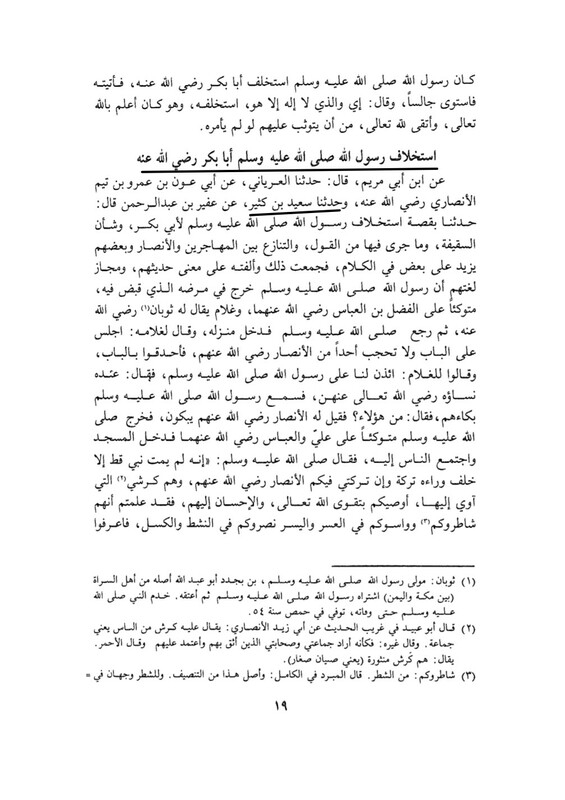 ➽ Conclusion: Al Imamah Wal Siyasah is a fabrication attributed falsely to Ibn Qutaybah! The famous biographers don’t even mention this book in his works. Beside, there is much difference in the narratives of Al Imamah and other books actually authored by Ibn Qutaybah!